I think this was the book in the series I had the hardest time putting down the second time through. After Harry Potter and the Whiny Depression that was Order of the Phoenix, this felt like a return to form. We have the adventurous Harry from the earlier books back, with the adult stakes that rise with each series entry. 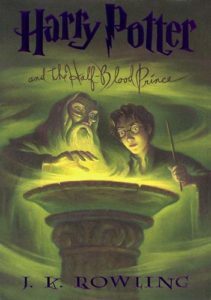 The central mystery – who is the Half Blood Prince – managed to be just as exciting the second time around, even if I remembered who actually owned the book with all the impressive annotated spells that Harry benefited from. Rowling’s skill at world building is also in fine form here; with the pensieve being used to explore memories, we get loops closed that I’m pretty sure were narrative convenience as opposed to actual mysteries, but they never feel contrived. And Harry’s look at his father’s past as something of a cocky bully allows some shades of gray in what has been an essentially black and white view of the wizarding world so far, a theme that carries over in the character of Horace slughorn. Ultimately the ambiguities are what made this my favorite. The fake out with Felix felices was somewhat predictable, but Harry’s reliance on Hermione’s rule following nature to catch him “dosing” Ron selling the ruse was clever. The half blood prince being a help to Harry but not being entirely trustworthy with sectumsempra showed that Hermione’s cautious nature wasn’t entirely unnecessary. It all sets up the climax and heel turn of REDACTED (15 year old book, but no spoilers here!) quite nicely; not everything is as it seems.